When you write historical fiction, you face great scrutiny. The tiniest mistake, or an over abundance of details, and you will generate comments. Angry heated comments. 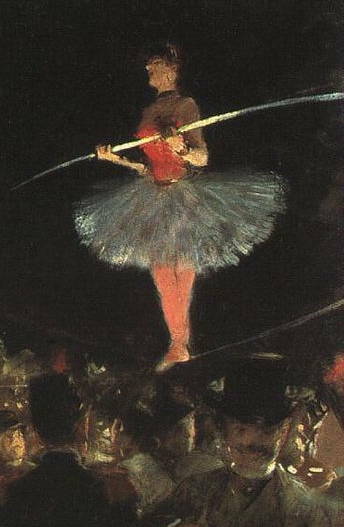 In a sense, you are always walking a tightrope between crafting authentic sounding prose and creating intelligible prose. One wrong foot and everything comes crashing down. If you want to create great period fiction, you must learn to balance the needs of the history junkie, while still tempting the shy newcomer to the genre. In my last two posts, I showed you some tips for building your own historical word banks. Hopefully, dozens of new phrases dance around in your head, each one tempting you to begin a new chapter. Now, I’ll share my top four tips for incorporating historical terms into your fiction. 1. One great historical word is worth at least three ordinary words, so don’t over do it. You don’t want to come off sounding like a bad translation of English. Think about where you want to put your emphasis. Many historical writers favor a modern style in the exposition, but turn up the heat with dialogue. Others reverse the dynamic. Some writers scatter period appropriate language throughout the novel to create a full immersion effect. Regardless of your style, go easy on the vocabulary lessons. Make sure when you reach for an archaic word you’re doing it for impact, not just because you can. 2. Learn to respect the spirit of the time, while foregoing the exact phrasing of the time. As I mention above, you don’t need to make every word period. No one expects you to write a novel completely in Old English, even if that novel’s set in Roman Era England. However, you could use only English words for your non-Roman characters and you will make a strong historical impact. That may sounds like a strange suggestion, but foreign words swell the English vocabulary. An estimated 26% of the modern English vocabulary was adopted from the French. Unless you’ve trained for a spelling bee, most people never think about word origins. A child has no more understanding that the word “Judo” is an import, than most adults understand that the word “garage” is. Knowing about a word’s origins is a powerful tool, and one the best writers understand and use to their advantage. 3. Use word origins to help you define your characters into social classes and round out their back-story. Some may call it a stereotype, but there’s a reason why readers expect aristocrats to pepper their sentences with French or Italian. The ability to converse in a non-native tongue has always defined class and social ranking. The higher the class, the higher the probability of a vast non-native vocabulary. That’s a historical fact, so use it for your characters. Research your era. What languages held favor with the elites and which caused disdain? Slip in words from the non-desired language and cast unfair aspersions on your protagonist’s good name. Or use them to plant the seeds of your antagonist’s future treachery. 4. If you want to play the game you need to learn the rules. As a writer, you should already understand grammar, but do you know about the underlying science that governs all languages? If not, it’s time to make friends with linguistics. I’m not advocating a return to school, but an hour or two in a public library wouldn’t hurt. Let’s say you’re interested in writing about ancient people. Try to learn a bit about folk taxonomy. Also called vernacular taxonomy, this is the system by which people named and gave order to the natural world around them. Study your people; bring their names for flowers, animals and geological features into your story, and give your readers a strong sense of time and place. Once you start to think about English as being dynamic and always changing, you can start to manipulate language to do your bidding. Play with new concepts, combine words modern readers already know in unexpected ways. Surprise and delight your reader with careful use of your great new vocabulary.